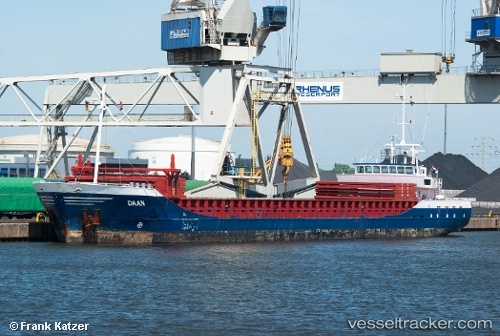 During the call at Sczcecin the "Daan" lost a crew member in an accident. The hatch wagon with a hatch attached started sliding towards the accomodation block in a storm on Dec 3 and hit the man who was standing on the deck. He suffered fatal injuries. On Dec 5, 2016, at 4.30 a.m. the "Daan", while enroute from Szczecin to St. Malo, encountered technical trouble with the main engine while entering the Great Northern lock of the Kiel Canal being westbound in Brunsbüttel. The engine could not be reversed, and the ship slammed into the closed gate 1. The bow suffered significant damage, the bulwark was torn off in large areas. The gate was deformed and was actually being investigated regarding the chance to keep it in operation without extensive repairs. The ship was moored at the pilings of the inner Brunsbüttel port at the South shore.